ATK are now officially on board with the Stratolaunch system, following a deal with the launch vehicle’s main partner, Orbital Sciences Corporation. ATK will provide the first and second stages for the vehicle – nicknamed Pegasus II – that will be air-launched from a huge carrier plane, with test flights set to begin as early as 2017. Announced at the end of 2011, Stratolaunch was revealed as a collaboration between inventor, investor and philanthropist Paul G. Allen and Scaled Composites founder Burt Rutan. They envisioned a rocket that would be launched from a giant carrier aircraft, portrayed as having a wingspan of 385 feet, making it the largest airplane, by wingspan, to ever fly. The aircraft will be powered by six 46,000-66,500 lbf thrust-range jet engines, that are planned to be sourced from two used 747-400s that have already been purchased. These planes will be cannibalized not just for their engines, but also the avionics, flight deck, landing gear and other proven systems that can be recycled to cut development costs. The aircraft is likely to be based at the Shuttle Landing Facility (SLF) at the Kennedy Space Center (KSC), a famed facility that is currently involved in negotiations between NASA and Space Florida for the commercialization of the runway that once hosted numerous Shuttle landings. 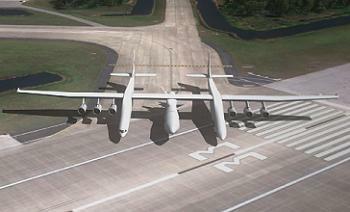 While the SLF’s 300 feet wide, 15,000 feet long strip, is firmly in Stratolaunch’s sights as the potential East Coast location for their missions, the focus will initially be to the west, with Stratolaunch systems already signed up to a 20-year lease agreement with the Kern County Airport Authority, Mojave, California, for the lease of 20 acres at the Mojave Air and Space Port. The launch vehicle that will ride with the Stratolaunch carrier aircraft is being designed by Orbital, after taking over the project when Stratolaunch and SpaceX – the initial provider of the rocket – parted ways. Exclusive details (L2) note the Orbital rocket, tagged as Pegasus II, will have a GLOW of 485,000 lbs resulting in a payload capability to Low Earth Orbit of 13,500 lbs. These two stages will sport additional performance via an updated propellant mix, under development by ATK, who officially joined the team via a statement on Tuesday. The contract from Orbital includes the design, development and flight hardware for initial Stratolaunch missions and expands on their partnership that dates back to the development of Orbital’s original air-launched vehicle, Pegasus, which also uses ATK solid rocket motors for stage propulsion. 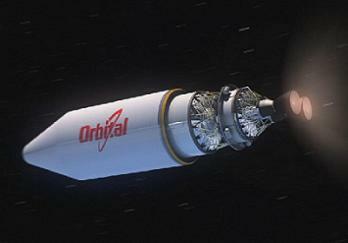 ATK also provide orbital propulsion for Orbital’s new Antares launch vehicle, which debuted earlier this year ahead of its opening role with the Cygnus spacecraft next month. 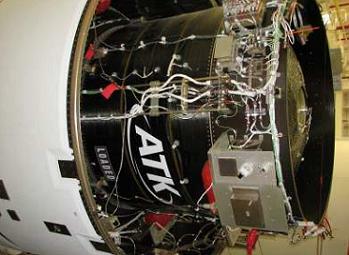 “Our design solution for the ALV will take full advantage of ATK’s experience with large diameter solid rocket motors, like those built for the Space Shuttle and for the Titan IVB launch vehicle,” added Scott Lehr, vice president and general manager of ATK’s Defense and Commercial Division. 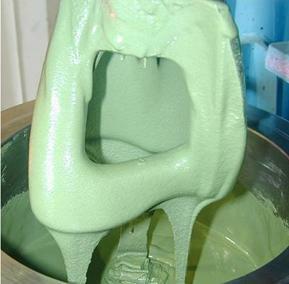 ATK are also busy at work developing new mixes for their Advanced Booster project for the Space Launch System (SLS), an area the Utah-based company are well-versed in. Per the additional details provided to L2, the rocket will also have a Thrust Vector Control (TVC) system on both the first and second stages – unlike Pegasus, which does not have a TVC on its first stage. The first two stages will act like a single first stage, given they will provide half of the required Delta-v. However, new information notes the first stage may also be recoverable after staging and splashdown. 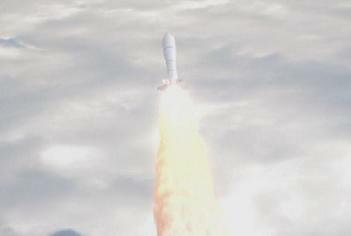 Once the solid stages have been expended, a restartable cryogenic third stage – currently baselined as utilizing two Pratt & Whitney Rocketdyne (PWR) RL-10 engines for the development and early flights of the rocket – will be used, pending development of a higher thrust LOX-Hydrogen unit. The human rating effort continues to be classed as only at a very preliminary concept. However, Pegasus II would be able to grow into such a role. Information states that a future manned winged vehicle would replace the fairing and have an equivalent lift, which is classed as the reason the main wing appears small and located on the aft of the vehicle. (Images: via Orbital, Stratolaunch, ATK and L2).